(Newser) – Only those with hearts of steel chiseled out of her infamous wrecking ball could watch Miley Cyrus sing about Pablow, her dearly departed blowfish, and not feel all the feels—especially with lyrics like "How can I love / Someone I’ve never touched / You lived under the water / But I love you so much." She also confesses she can't go out with pals anymore for sushi, because "watching my friends eat my friends ruined my appetite." 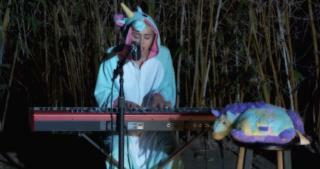 But the video posted for her Happy Hippie Foundation's "Backyard Sessions" isn't without theatrics: she's tickling the keyboards dressed as a unicorn, with a sympathetic-looking stuffed unicorn forlornly watching her performance from a nearby stool. this "young lady" needs to get some counseling for her issues. If she is having this much trouble over her fish, ...well I just do not know what to say. She just keeps getting weirder & weirder. Wonder where Hootie & the Blowfish went??? ?